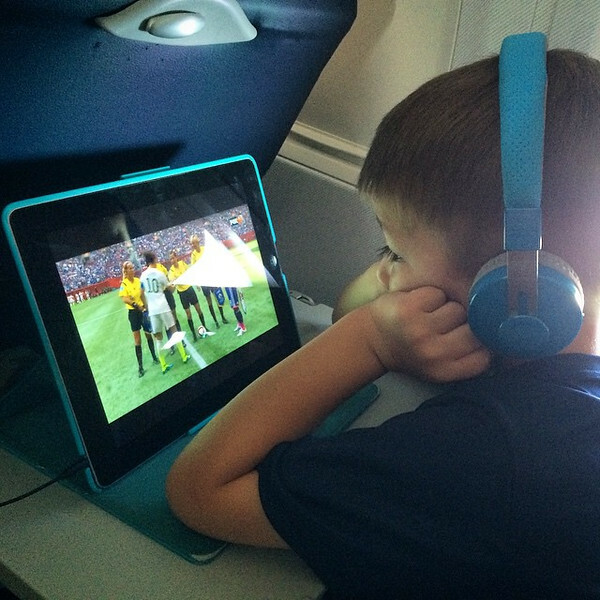 Flying Alone With Your Kids: My Ten Survival Tips Mama Say What?! | Mama Say What?! 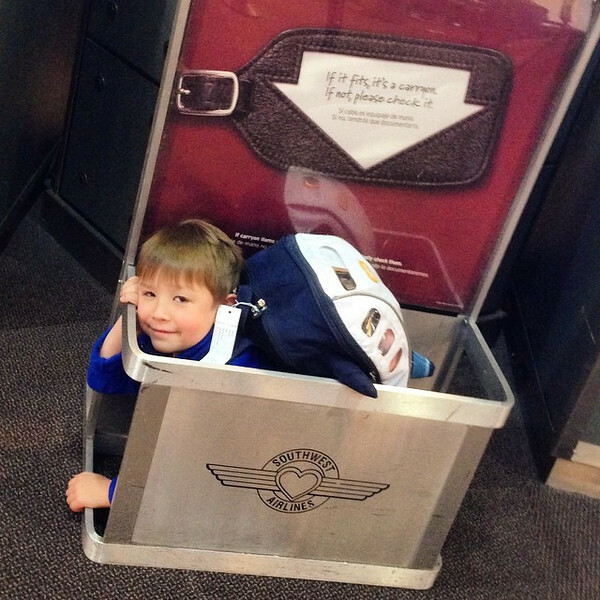 My husband and I are seasoned travelers with our oldest son, who will be six later this year. We keep track of his trips with over 110,000 miles so far! He can identify at least half a dozen airlines by their livery and he knows that being chatty and friendly with the pilots and flight attendants often gets him a special snack or some plastic wings. My oldest and I have flown, just the two of us, many times and we had a great routine going that often included a stop at Jamba Juice to share a smoothie (depending on the airport) and a few minutes spent watching the ground crew with hopes that one would look up and wave to us. His little brother was born last year and I learned that flying with two is a whole other challenge! 1. Head to the airport a lot earlier than you would normally. This applies to when you’re flying with just one kid too. My first time flying alone with my two boys I left my house over two hours beforehand knowing I would probably forget something or we’d have to stop because my youngest had a freakout on the way (he hated being in the car for a while). Sure enough, once I got on the freeway, I realized I forgot a copy of M’s birth certificate and had to turn around and get it. Naturally, the guy at the ticket counter didn’t ask to see it, but if I had chosen to leave it at home, I’m sure he would have asked to see proof of age. When flying home, I was asked to show his birth certificate when checking in, and I have had to show it multiple times since. As soon as you get your baby’s birth certificate, make a copy and stick it in your diaper bag. 2. Babywearing rocks! Babywearing isn’t just some crunchy-mama fad. I honestly don’t understand why more mamas don’t practice it. My baby is happy and I have both of my hands free!! Even when I’m flying with my husband, I wear M in a baby carrier (Líllébaby Embossed is my current fav) and our diaper bag is a backpack. My ID and boarding passes fit in the pocket on my baby carrier. 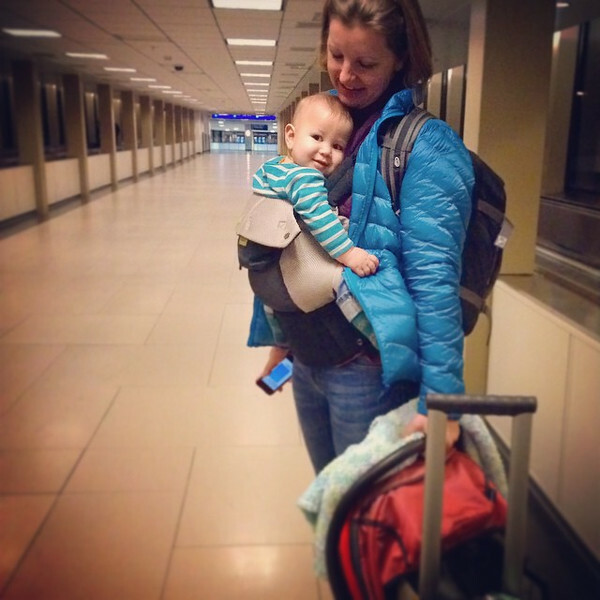 I’ve talked about my love of babywearing and how convenient it has made airplane travel before. I know that a lot of mamas like to bring their stroller, and that’s totally okay. But I prefer to fly without it. When flying with two kids, it’s become even more of a lifesaver to wear my youngest, making it easy for him to sleep and me, mobile with both of my hands free. 3. Carry as little as possible, but be prepared. I prefer to have as little to carry as possible, but I also want to be prepared. In my carry-on bag (a Timbuk2 backpack), I bring a couple more diapers than I think I’ll need. I pack a muslin blanket that can act as a burp cloth, shade covering, nursing cover, a blanket in overzealous air conditioning, or a picnic blanket on an airport floor. I pack a spare change of clothes for M along with spare pants for myself. I pack spare pants and underwear for my oldest too. Even though he’s been potty trained for a long time… you just never know. Lastly, I pack snacks for all of us in case my oldest decides he doesn’t want to eat the $10 airport sandwich I just bought. 4. Don’t try to be sly and change a diaper on your lap. Use airport bathrooms or the airplane lavatory. 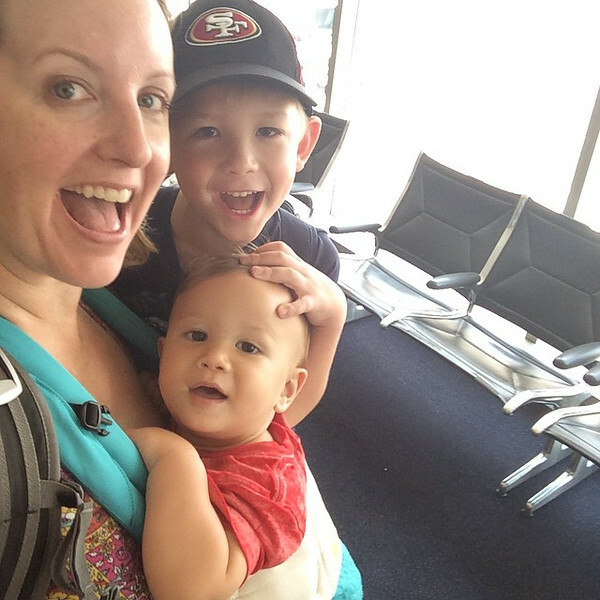 While waiting to board the very first time I flew alone with my boys, I didn’t want to walk down to the bathroom and change M’s diaper. Naturally he chose that moment to pee all over me. He also gets occasional blowouts that no diaper can contain, so a pair of yoga pants are always in my backpack when flying now. If you’re on the airplane, don’t change your baby’s diaper on the tray table either. People eat off the tray tables. And please, please, please, don’t leave a dirty diaper in the seat back pocket. It’s gross. 5. Subliminal sleep messages can actually work. This tip I picked up from Scary Mommy’s Travel Guide. 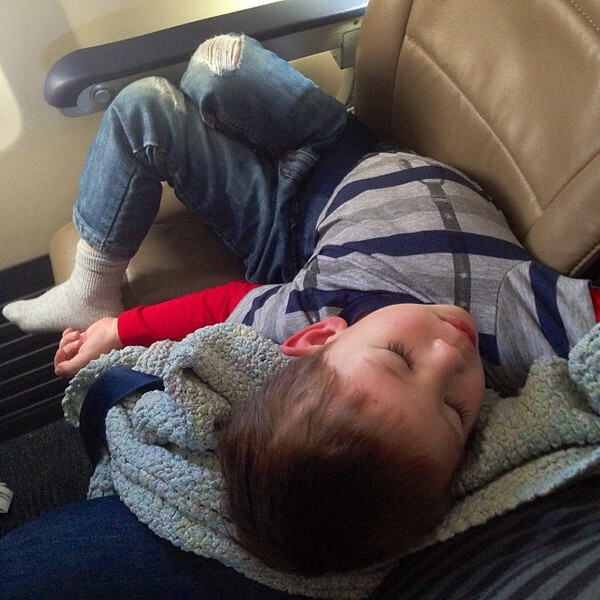 My oldest had been slowly dropping his last nap when my youngest was born, but I really needed him to nap on a flight to visit my parents. My brain needed a break from his near-constant talking. On the way to the airport I told him he was going to get really sleepy on the plane and that it was okay to take a nap, this flight was going to have sleepy dust in the air vents. I repeated it a few times and brought it up again as we were boarding. I helped him kick off his shoes and snuggle with his blanket, iPad, and headphones. Once the plane rotated, he was out. Thank you so much Scary Mommy!! That tip has worked more than a few times! 6. Bring a treat for the flight crew. Every time we fly, we bring some chocolates for the flight crew. These are usually some Ghiradelli squares or a small box from See’s. Sometimes it earns a treat for our oldest from the crew in the form of a coloring book or some plastic airline wings. A couple of times I’ve been offered a free cocktail as a thank you. We never expect anything in return, but it’s often a nice way to say thank you to the flight crew, who are often under-appreciated. It’s also a roundabout way to preemptively say thanks in case one of our boys becomes “that” kid on the plane and cries incessantly, gets sick, or has an accident. We’ve been very lucky that both our boys have done really well on airplanes. But when it’s past nap or bedtime or one is way overstimulated, it’s a gamble that confining said baby to a seat for a few hours won’t cause a meltdown. I don’t apologize for my kids simply acting like kids, but if we have a rare bad day, I like to make sure that our flight crew is still appreciated. 7. Headphones are highly recommended for older kids playing with electronic devices. We got some wireless Bluetooth headphones from Lil Gadgets and TJ loves them. They connect very easily to our iPad or my iPhone so he can play games with plenty of sound without disturbing other passengers… or me. And they came with a cable to allow him to plug in to an airplane’s entertainment system for when we fly an airline that has one, like jetBlue! 8. Don’t expect to do anything for yourself during the flight. Many times I’ve brought my Kindle with me, hoping that I’d get some time to chill and read if both my boys fell asleep. Nope. Nada. No way! I found that expecting to do something for myself just ends with disappointment. So while I still bring my Kindle, I focus instead on making my kids happy for the whole flight. If they both happen to fall asleep, then it’s a bonus flight for me with a Coke and my Kindle. 9. Unexpected items can provide fantastic entertainment. We have learned that sometimes a plastic cup and a straw from the flight attendant can keep an antsy toddler occupied for upwards of a whole hour. With my oldest, I would keep a handful of disposable chopsticks in my diaper bag since he loved to open them and then separate the chopsticks. Sometimes just the information cards in the seat back pocket can do the trick for a bit. 10. Accept help when it’s offered, within reason. More than once, strangers have offered to hold a bag for me while I secured M into my baby carrier or get my backpack out of the overhead bin. Once, while waiting to use the only bathroom stall that had a changing table, a woman offered to hold M so I could go pee. Lol! The most gracious help I’ve received was in the form of a 25-year-old woman whom my 5-year-old became instant friends with in the security line when he found out she was going to be on our flight. We all sat together and she and TJ chatted. He fell asleep near the end of the flight and was NOT waking up when we deplaned (in his defense, it was almost 1 a.m.). As I was putting my sleeping infant in my carrier, I told this lovely woman she could go ahead and I’d wake TJ up to get going once I got our stuff packed. Instead, she CARRIED my 40 lb preschooler off the plane. He woke up and gave her a hug to say thank you and then she offered him a piggy-back ride to baggage claim and totally made our long night. Of course nothing like that has happened again, but I still run into helpful and friendly people each once in a while… people who understand that flying with kids isn’t easy. What tips have made air travel easier for you and your family? Added by Alex T. on August 4, 2015.